Whether you’re into mountain biking or cycling, biking on or off road can be beneficial to your overall health. Biking for leisure along a paved trail is an excellent way to spend a sunny afternoon with the family outdoors while getting some exercise. For the more adventurous, mountain biking along a scenic outdoor trail provides an opportunity to explore nature off the beaten path. However, leisure, amateur and serious cyclists and mountain bikers must be careful because biking at any level is not without risk of injury – whether it’s from a fall, overused muscles and joints, or improper posture or balance. And whether you’re riding a bicycle for fun, for health or for sport, you can be certain physical stresses from biking can take a toll on muscles, ligaments, tendons, and nerves over time and trauma to other parts of your body can radiate to your spine, misaligning and damaging it. That’s why you’ll see chiropractors on the medical staffs of professional sports teams, as well as at the Olympics. Thus, if professional and Olympic athletes and cyclists can benefit from chiropractic care and pain management, then you can, as well. Neck/Back: This includes tightness in the neck and lower back pain, as well as piriformis syndrome, which is when the piriformis muscle cramps, pressing on the sciatic nerve and causing buttock pain or sciatica. Shoulder: This includes AC joint sprains and clavicle (shoulder or collar bone) fractures. Hand/Wrist/Forearm: This includes numbness and pain, as well as elbow dislocation, lateral epicondylitis (tennis elbow, which also applies to cyclists), ulnar neuropathy, Cyclist’s Palsy and Carpal Tunnel Syndrome. Foot: This includes numbness and tingling, as well as plantar fasciitis in the heel and arch pain. Knee/Leg: This includes Cyclist’s Knee (Patellofemoral syndrome), patella and quadriceps tendonitis, medial plica syndrome and iliotibial band friction, which either affect the kneecaps or outer knees. This also includes Achilles tendonitis and thigh and hip flexor strain. Muscles: This includes soreness that lasts and goes away in 24 hours and delayed onset muscle soreness (DOMS) that lasts longer than 24 hours. Avoid trauma to the face and head by wearing a helmet. Make sure your bike is properly fitted to you. Adjust your seat height so it’s not too low or high. Avoid pudendal neuropathy, a numbness or pain in the genital or rectal area, by using padded shorts or seat or changing the tilt of the seat. Always stretch before a ride. Knees should be aligned with your feet when riding. Use the entire pedal stroke completely to avoid pointed toes and fatigued and cramped calves. Adjust your handle grip frequently and avoid grasping too tightly. Don’t constantly tilt your head to one side. 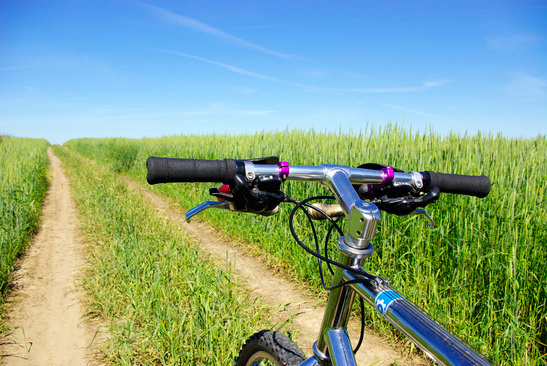 If you’re a biking enthusiast who’s seeking chiropractic care to treat a sports-related injury or to prevent injury on the bike trail, then give Dr. Todd Goldman at Total Chiropractic Care and Wellness in Medford a call at (631) 447-2299 today. He can help with conditioning and exercises to enhance speed and flexibility, manipulations to improve range of motion and adjustments to strengthen balance and improve posture and alignment. Studies have shown regular chiropractic care help athletes recover more quickly and heal properly, reducing pain and diminishing inflammation, so they can get back on the bike sooner. Also, see our previous posts in the Chiropractic Care for Leisure Sports series: Running, Skiing and Snowboarding, and Basketball.